Interested in making your own soap? It’s not difficult, but there is a chemistry behind it and safety measures you must take. 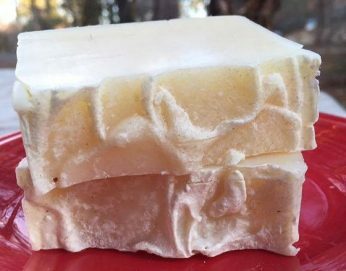 In this three-hour basic soap making class, you will learn the basics of cold-process soap making. The ingredients, soap making utensils, and safety equipment needed to make your own natural bars of soap will be provided. In addition, there will be a variety of essential oils and botanicals available for use. At the end of the class, you will take your soap home in its mold to sit for 24 hours before being sliced and left to cure for 4-6 weeks. You will also receive a booklet to take home in order to replicate the process. Karen Creel is the owner of Gardenchick. She loves to create handmade beauty products from natural ingredients that include herbs, flowers, minerals and pure oils. She lives on 4 acres where she gardens, creates DIY projects using her “junk” finds, and raises a small flock of free-range hens. On her blog www.gardenchick.com, she brings you gardening tips, urban homestead projects, and recipes for her natural skin care products.